More words have been written about this series than can be held in a typical library. It's one of those rare oddities you'll love or hate, but either way, you'll feel passionately about it. 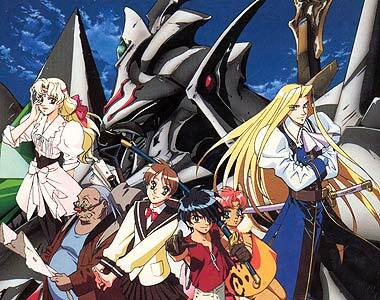 Escaflowne draws heavily on several different anime genres, such as classic mecha, sword-and-sorcery, and magical girl adventures. This series has a lot going for it — great art direction, fantastic character development, and intriguing storyline that gets more and more elaborate as the series progresses, as well as a top-notch musical score by non other than Yoko Kanno (of Cowboy Bebop fame!). Of interest is that the giant robots battle each other with swords, essentially, very large medieval armor (shades of Aura Battle Dunbine!). Otaku love to debate this series at every convention. 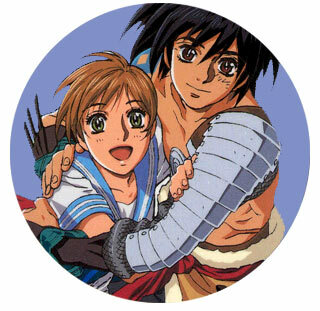 The combination of teenage romance, fantastic robot-suits ("guymelefs"), elaborate battles, histrionic villains, and a world-threatening challenge has made the 26-episode series a favorite among many. And don't think you saw it last year on Fox Kids Network — that was a heavily chopped version.